We’ve all heard of fibre and the fact that it’s something you should include in your dog’s diet. But what is exactly is it? And why should you endeavour to ensure your dog is eating some fibre as part of a healthy, balanced diet? Fibre is a type of carbohydrate that your dog’s body cannot break down. Whereas other carbohydrates are broken down into sugar molecules, dogs lack the digestive enzymes required to break fibre down. This means any fiber you dog consumes passes through their body undigested. Fibre can be classified in a variety of ways, including based on the rate at which it’s fermented or how viscous it is. It can also be classified as dietary fibre – that is, fibre found naturally in foods – or functional fibre – fibre that’s extracted from whole food subsequently added to processed food. However the most common way that fibre is classified is by its solubility in water – that is whether or not it dissolves in water. This post will focus on fibre with regards to solubility. Certain microbes found in the large intestine are able to break down fibre to a varying degree. This bacterial fermentation produces fatty acids that act as an important energy source for the epithelial cells lining your dogs gastrointestinal tract. As the name suggests, insoluble fibre is the opposite of soluble fibre – it does not dissolve in water. Instead, insoluble fibre passes through the digestive system pretty much intact. Its main function is to help push food through the intestinal tract to allow sufficient absorption of nutrients but not cause constipation. It is important to remember that fibre-rich foods typically contain both types of fibre. While not necessarily considered essential, there are a lot of health benefits that come with including fiber in your dog’s diet. 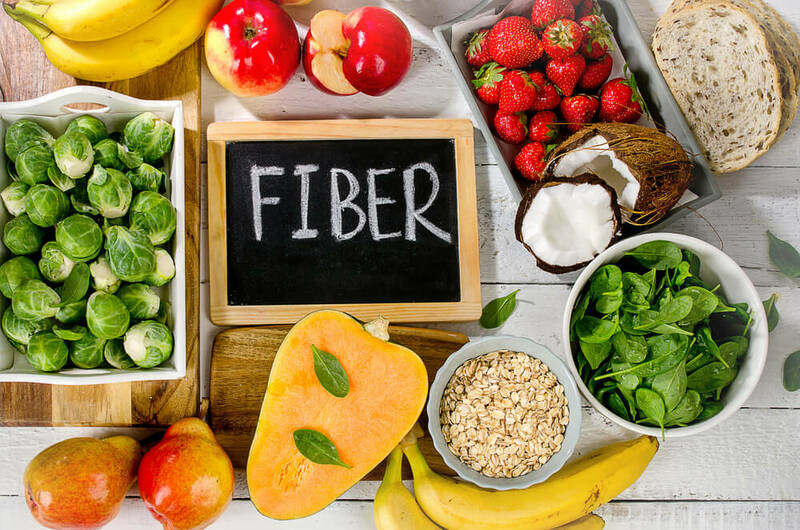 For example, while it may sound contradictory, fiber is known to play a role in treating both diarrhoea and constipation. Because it can absorb water, soluble fiber can help dog’s with large bowel diarrhoea form stools and better control their bowel movements. On the other hand, constipation can be prevented and treated with both soluble and insoluble fiber. Insoluble fiber doesn’t absorb water, meaning it can speed up the passage of food and waste through the digestive tract, while soluble fiber keeps water in stools making them softer and easier to pass through your dog’s digestive tract. Care should be taken with insoluble fiber because too much of it can act as a natural laxative. And if your dog experiences diarrhoea or constipation for a long period of time, speak to your vet. Fiber is also known to play a role in appetite and weight management. As a food it has very few calories, meaning dogs can consume a lot of it without gaining a lot of weight. At the same time it’s very filling, meaning dog’s tend to feel fuller for longer and in turn, eat less. Essentially, it can create a feeling of satisfaction and fullness without adding extra calories. In this way it can both prevent dogs becoming obese and it can help dogs who need it to lose weight. Diets rich in fiber are also thought to help reduce the risk of diabetes by playing a role in controlling blood sugar levels. While fiber is often included in commercial diets, for those who feed their dogs a home-cooked meal, the importance of fiber shouldn’t be overlooked. Foods that are rich in fiber also have other health benefits too, so every effort should be made to include them in your dog’s diet. And while there are different types of fiber, unlike fats, neither is necessarily better than the other. Both soluble and insoluble fiber are beneficial to your dog’s health, meaning both should be incorporated into a dog’s diet.